Gavin: Hey Hillary, first thing, tell us a bit about yourself. Hillary: I guess for starters, I am 27, vegetarian, married to an amazing creature (we have been together almost 11 years now). 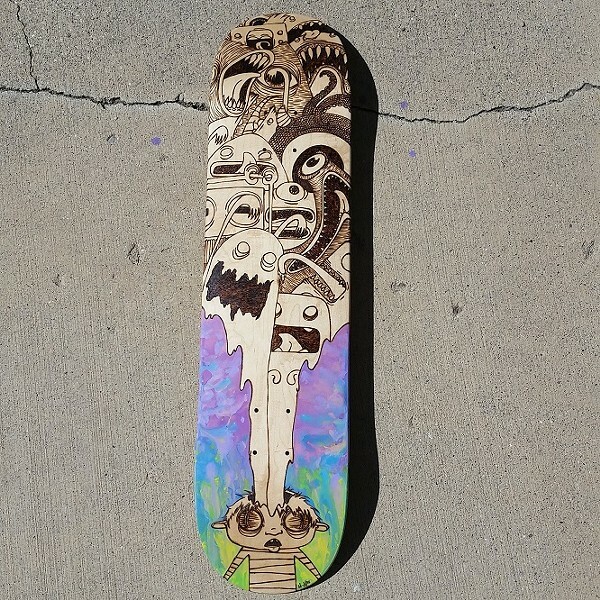 I was born and raised in Utah, I spent most of my adolescent years skateboarding, drawing and starting fires in my basement. I am a licensed cosmetologist, but I don't do hair much anymore. I played roller derby for a few years until I got injured; now I just roller skate for fun. I still skateboard as much as I possibly can and I love to spend as much time as possible surrounded by trees—hiking or just chillin' at the park. I am currently working part-time as a nanny and have been working with the same family for almost four years now. I never leave my house without a sketch book, water bottle, and plenty of Microns and Sharpies. Gavin: What first got you interested in art, and what made you gravitate toward drawing? Hillary: I have always been interested in art. When I was a little kid, I loved to create. I was constantly drawing, coloring, painting, sewing and sculpting with Play-Doh. I knew very early on that I wanted to be an artist when I grew up. So I just kind of naturally gravitated toward drawing and other crafty things. 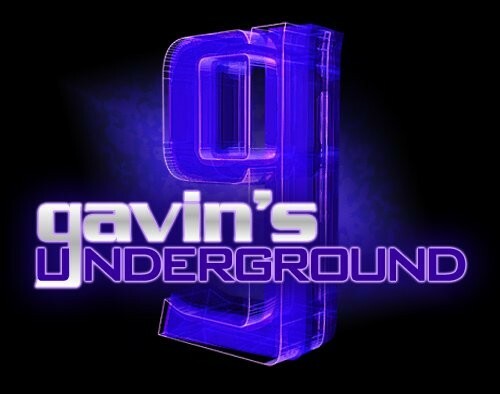 Gavin: Did you have any major influences behind your style? Hillary: Salvador Dalí has always been one of my favorite artists. He had a major influence on my work, especially when I was in high school. My little brother, Sebastian, has also played a huge role in sculpting me as an artist. He has always helped me see things that I never knew were there. My 12th-grade art teacher, Mary Ann Hess, inspired me to pursue art in a way I never thought possible for myself. 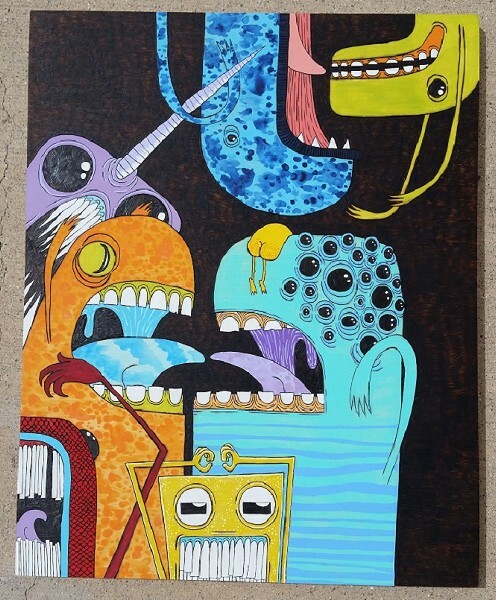 Alex Pardee and Skinner have also influenced my work a great deal. But I think the artist who has had the greatest impact on me recently has been Joey Stupor. I found him on Instagram last year and was absolutely blown away by his work. Not only is he a fantastic artist, he is also very kind and very helpful. Also, cartoons!!! Any and all cartoons—TMNT, Yu-Gi-Oh!, Spongebob, Adventure Time, Invader Zim, Powerpuff Girls just to name a few. Gavin: What was it like for you developing your style over time and finding your own niche? Hillary: Oh man, developing my style over the years has been such an incredible process! Not always pleasant, but always interesting. I remember being young and drawing my favorite cartoon characters, then after a while, I started to develop my own characters. I saw that I adopted so many elements from so many different artists and kind of morphed them into my own little Frankenstein style. At this point, I am pretty happy with it. I am certainly not finished developing my style and I hope I never am. I feel like once you are "finished," you stop growing. Gavin: What made you decide to try turning your art into a business? Hillary: I remember being asked at a very young age, "What do you want to be when you grow up?" and I remember being absolutely terrified, because all the other kids were saying things like “I want to be a doctor, teacher, officer or fireman.” I tried out all of those labels in my head at that time and nothing fit. I felt in that moment, that the only thing I could ever become was an artist or a soccer player (I was super into soccer when I was small). That is something that has always stuck with me. I took every single art class I could when I was in high school and even planned to go to SCAD when I graduated. That didn't happen. I went to cosmetology school instead and did hair for a little while. But I was never really happy doing that, I always felt like I had sold myself short ... and I was right. Around that time, my little brother Sebastian was starting up his own business in the music industry. I watched as he grew this tiny idea into something successful and beautiful. He changed so many lives and helped so many people in his pursuit, and it really inspired me to try to do the same. We talked a lot about our goals, and one day he basically told me to just shut up and do something about it. So I did—I started by painting/drawing on shirts, then I started making purses/bags/weird pillows and stuffed animals. But I never had any real direction. 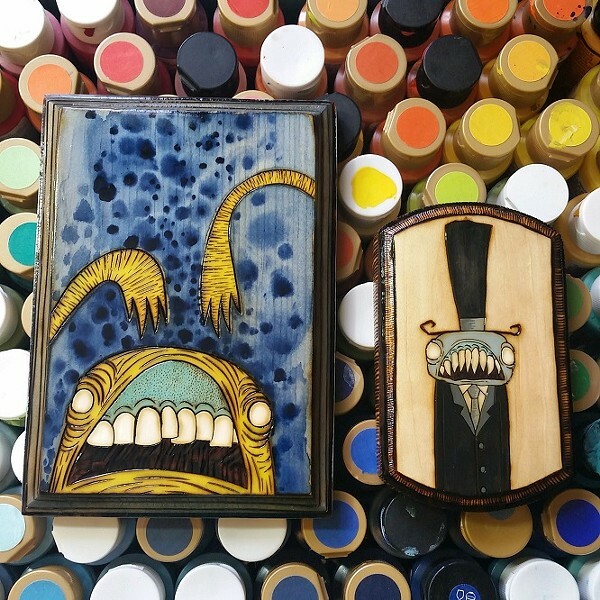 Shortly after, my cousin Kennedy introduced me to woodburning and it changed my life! 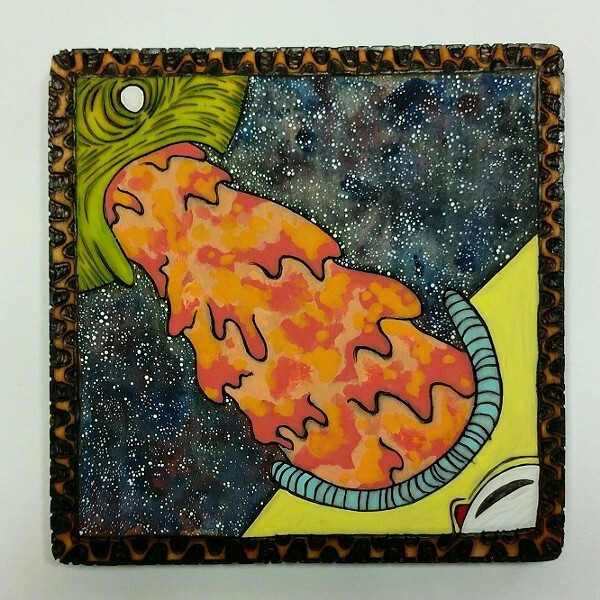 Now, all I do is burn and paint! Gavin: Did you start off with just drawings, or were you working with crafts at that time as well? Hillary: I think it was actually the crafting aspect that started it all. I use to make purses, bags, wallets and weird little creatures all the time when I was working grave shifts at the boarding school. Pretty soon, my co-workers started making requests, and I was usually happy to oblige. Then I started getting sketch requests from the students, and that was super fun because they were always so stoked to wake up and see what I made for them. It was always so rewarding to see how happy some of those kids would get over something as simple as a drawing. Gavin: What's the process for you in creating a new design, from concept to final product? Hillary: The creating process is always different. Sometimes I wake up with a concept in my head and it will take months to develop into a concrete idea. Other times, I will just be walking around or talking to a someone and just be struck with an image or idea. I have to jot it down immediately or it may disappear. Those are my favorite, because they feel more authentic and organic. I don't like to think too much about my work because then it feels forced. I really just like to let things flow. If things aren't flowing—I generally try to take a break. Gavin: Do you play around with your creations a lot, or do you stick to a design when you've chosen one? Hillary: I play around with my creations a lot once I finish the initial piece. When I have a concrete design in my mind, I try really hard to stick to that exact design. 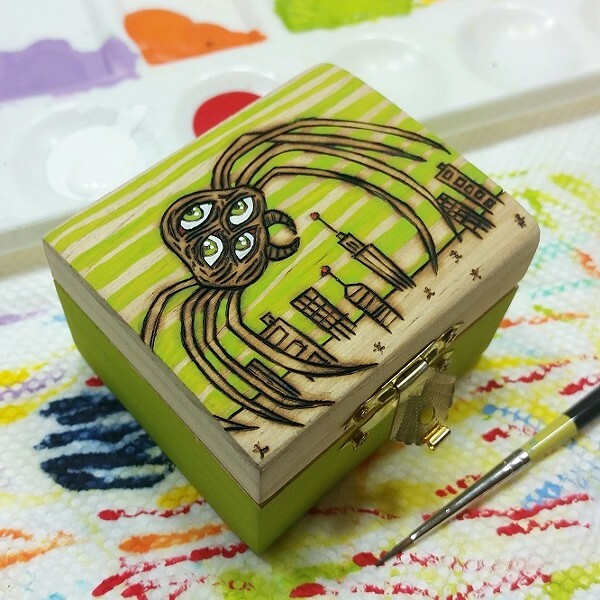 Which can be really difficult with woodburning, because you can't un-burn something. But when I am finished with a piece, I like to take a step back and take it all in. Then I usually sit down and sketch it out again and make all the changes my heart desires. It is a pretty fun process. During the burning process, if I make a mistake or burn where I shouldn't have, then the piece becomes free range, and I instantly stop caring and just go wild. Which can actually turn out so much cooler than the initial concept. Gavin: Some of your stuff is kind of simplistic, but then you have works that get very detailed and intricate, even at a small level. Do you find it challenging switching between those two extremes? Hillary: I find it to be quite refreshing, actually. Sometimes when I am working on a piece for a client who wants something very detailed and intricate, I start to lose my mind a bit and have to take frequent breaks. That is usually when I bust out a ton of really simplistic, carefree pieces. Those are usually the ones that I love the most. But then again, when I get too caught up just doing a ton of super simplistic pieces, I can get rather bored. That is when I start something new and extremely detailed. Then I panic and think, "What the hell have I gotten myself into?" But it usually turns out okay. Ha ha! Gavin: How was it for you going around and taking part in festivals and small shows? Hillary: Oh my, it has been such an amazing learning experience! The first real show I ever did was last September and it was Salt Lake Comic Con. It was such a terrible experience for me, but I learned more from that one event than I had the entire previous year. At first, I felt pretty defeated, but I had a lot of great people supporting and encouraging me to keep going. So I decided to step it up and take my work to the next level. After I took some time off to restructure and prepare, I dove head first into the world of festivals and shows and applied for every single thing I could find. I was accepted into Big Sky Pride in Montana this past June and it was a huge success. I was also accepted into Urban Arts Fest and Craft Lake City as well as some other smaller markets. 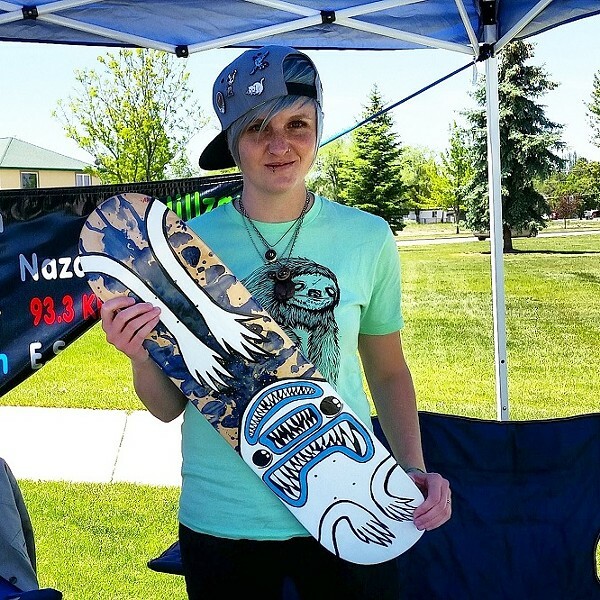 I also entered the skate deck design contest at UAF and my board took first place. I can't even remember the last time I was that excited. Gavin: As far as physical items go, you've put your touch a lot of items from skateboards to jewelry boxes to shoes. 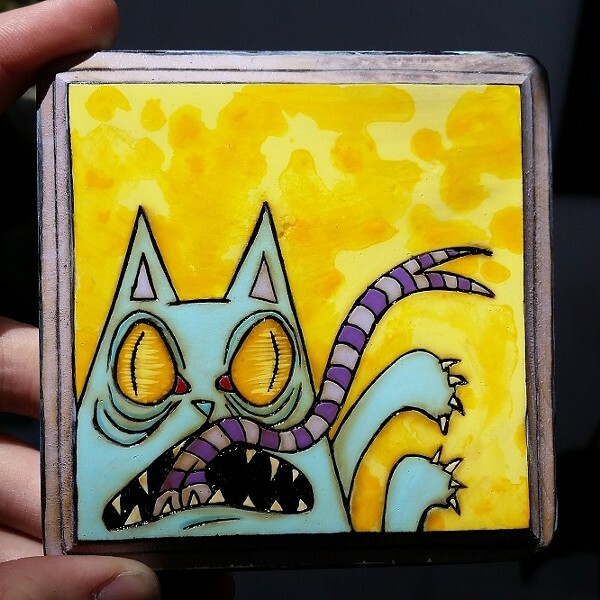 What do you look for in an item when you want to put your art on it? Hillary: The main thing I look for in physical items is how much workable space does the item have. But I also have to ask myself, "Will I need to alter the item in any way to make the image work? What is the item made out of and how can I best protect the image against the elements? Is this going to be worn, displayed, or used heavily?" These are the type of questions that go through my head before I start on pieces that have the potential to be ruined like hats, shoes, skateboards, and roller skates. Gavin: Do you do custom works for people? And if so, how can they get a hold of you? Hillary: Yes! Custom work is what takes up most of my time these days. 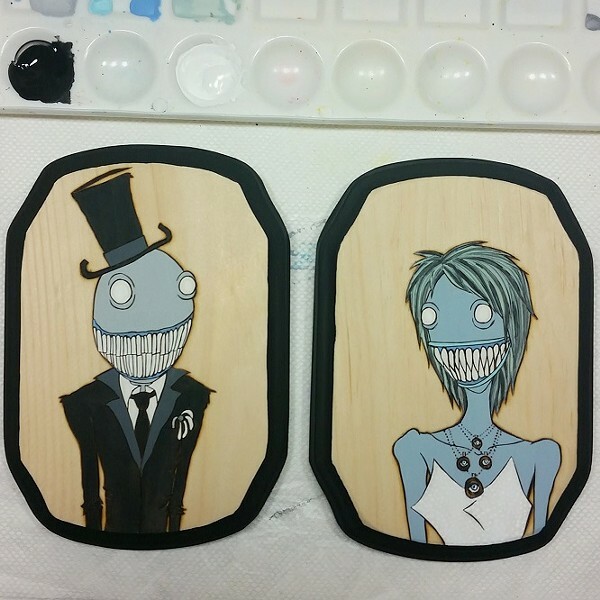 I do a lot of pet portraits and monster family portraits, but I also do a lot of random custom work too. I only take commissions when I feel like I can do the job and be happy with the result. The best way to get in contact with me is through Facebook, Instagram or email Hillzart@hotmail.com. I am usually very responsive. Gavin: Are you looking to expand your works in any way yet, or are you happy as things are now? Hillary: I am actually in the process of expanding right now, which is extremely exciting! I have a not-so-small obsession with hat/lapel pins and T-shirts, so that is probably going to be my next big investment. Hillary: Expect nothing and you will never be disappointed. Ha ha! But really, I want to take the rest of the year to develop some of my new ideas and concepts and see where those will take me. I have been working super hard this year and I am ready to let things kind of settle down so I can focus on the new! I will be turning out a few pins before the year is up and I have a few more markets/shows before December. But I usually work way too hard during the holidays, so this year I plan on taking December off to just chill with family and friends.